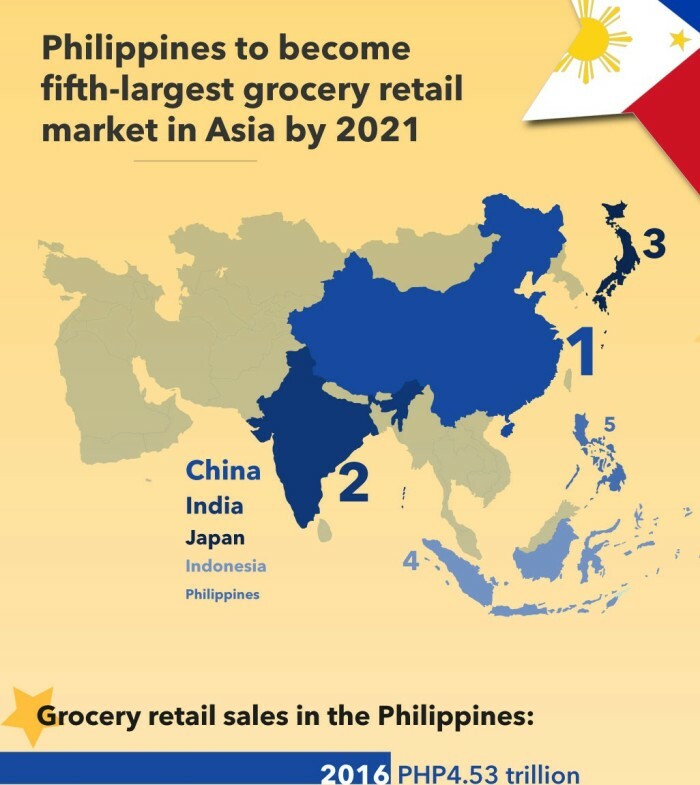 The grocery retail market in the Philippines is forecast to grow on average 9.3% year-on-year between 2016 and 2021, which will make it the fifth-largest grocery retail market in Asia, according to new data released by IGD, the international grocery research organisation. Grocery retail sales in the Philippines are set to amount to PHP7.08 trillion (US$149.99bn) by 2021 from PHP4.53 trillion (US$95.98bn) in 2016. This will be driven by a growing population, strong domestic consumption and a buoyant economy. For the first time ever, the country is expected to move up from sixth place to become the fifth-largest grocery retail market in Asia, after China, India, Japan and Indonesia. Domestic multi-format retailers dominate modern trade and have shown robust growth over the last five years, with SM Retail, Puregold and Robinsons the largest grocery retailers in the country. SM Retail, for example, is focusing on expanding its mid-sized and small format stores. In 2016, the retailer opened 144 stores, only one of which was a hypermarket, while 111 opened under the Alfamart minimarket fascia, through a joint venture with Indonesia-based PT Sumber Alfaria Trijaya. SM Retail continues to expand beyond Metro Manila; in 2016, 80% of its store openings were outside this area. Meanwhile, Puregold and Robinsons share a similar ambition to expand further beyond the Luzon area with their multi-channel strategies. 7-Eleven, the fastest-growing retailer in the Philippines according to IGD data, is also expanding its stores into smaller towns across the nation. Zhu continues: “Driven by more disposable income and increasingly urbanised lifestyles, Filipino shoppers are demanding more convenience in their grocery shopping. As a result, convenience and online are the hottest channels in the market. “The number of c-stores in the country is set to increase as domestic retailers continue to drive this part of the market, bringing in more convenience banners to the country. One of the reasons thatdemand for convenience stores is so high is because of the rising number of business process outsourcing, or callcentres in the Philippines. These arecentred mainly in urban areas, operate 24 hours a day, and tend to employ young people with disposable income who want to shop for their groceries as conveniently as possible. From 18 March onwards, the special edition will be available across major convenience stores and selected restaurants. ..
Paul Roebuck, last CEO of Saatchi & Saatchi Singapore and Malaysia is taking on a new role at BBDO. ..